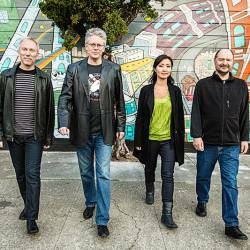 For over 40 years, San Francisco’s Kronos Quartet has combined a spirit of fearless exploration with a commitment to continually re-imagine the string quartet experience. 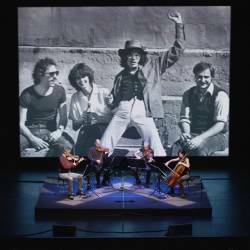 Kronos is one of the world’s most celebrated and influential ensembles, performing thousands of concerts, releasing more than 60 recordings, collaborating with an eclectic mix of composers and performers, commissioning over 900 works for string quartet, and receiving over 40 awards. 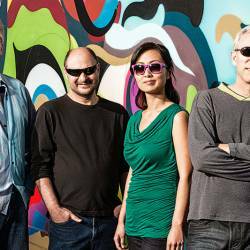 During a week-long residency, Kronos will perform three different concerts: one of recent works and featuring a new project with Wu Man and Sirojiddin Juraev, a family friendly musical journey around the world, and a live cinema performance piece that explores the power of music through Kronos’ past, present and future. A meditation on music itself – the act of listening to it closely, the experience of feeling it deeply, and the power that it has to change the world. An adventurous concert of new works never before heard in the Middle East, featuring the acclaimed Chinese pipa virtuoso Wu Man, and Tajikistan’s Sirojiddin Juraev, a master of Central Asian long-neck lutes, on dutar.